Bharat Sanchar Nigam Ltd (BSNL) Karnataka telecom circle today expand its 3G Mobile and Wireless Broadband services in 2 More cities named Davanagere and Chitradurga.Earlier BSNL already launched 3G mobile services in 4 Telecom Distrcis including the state capital Bangalore along with Mandya, Mangalore and Tumkur cities of Karnataka telecom circle. BSNL 3G services launched by Mr. S Jyothi Shankar,Genral Manager BSNL Chitradurga Telecom District at BSNL Office in Davanagere. 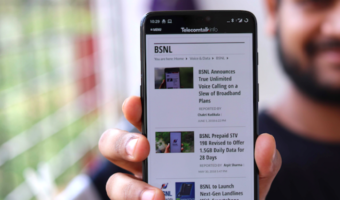 BSNL get tremendous response over 3G mobile services in both cities. According to the BSNL, the 1000 new subscribers (750 in Davanagere and 250 in Chitradurga) applied for 3G Mobile service on first day. With the launch of 3G services in Davanagere and Chitradurga now the 3G services available in 5 telecom districts of Karnataka. BSNL now can offer Video calls, High-speed Internet with speed Up to 3.6 Mbps, High quality multimedia services and live Mobile TV facility on 3G platform. The operator also launches an introductory promotional 3G offer wherein BSNL subscribers will get 50 free video calls and 25 MB Data usage who enrolled for 3G services up to 31st March 2010. Beyond free usage Local Voice and Video calls at just 30 Paisa per minute and All STD video calls will be chargeable at 50 paisa with the prepaid FRC120. BSNL 2G prepaid mobile subscribers can migrate to 3G service just by one SMS M3G120 to 53733 while for postpaid subscriber can send M3G25 to 53733. To get the new BSNL 3G Connections one can visit BSNL CSC in Davanagere and Chitradurga. There is no 3g service in chitradurga.